Many of these people prospect for gold as a small-scale prospecting or mining activity. But others make serious investments with mechanized equipment, and dig out a livelihood working placer deposits in stream valleys, terraces, beaches or dry concentrates. Most of the gold produced in the U.S. comes from lode deposits. About 80% of the nation’s annual domestic gold supply is collected at its 25 largest gold mines. The remaining 20% is derived from about 175 other lode gold mines as a byproduct of processing base metals (chiefly copper), and placer deposits. 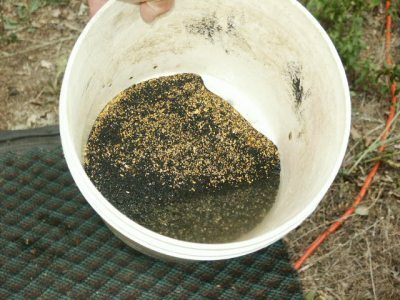 Estimating placer gold production is difficult to do. For 1994, the U.S. Bureau of Mines stopped “placer canvassing,” or collecting data about placer mines. The U.S. Geological Survey, Office of Minerals Information (OMI), which incorporated many of the duties of the disbanded Bureau of Mines, is expected to continue this policy. But even the Bureau of Mines had problems getting all placer gold information when it was reporting gold production, along with the various State agencies. When the Bureau of Mines was estimating domestic placer gold production from 1990-1993, it placed the total at 1% or 2% of the nation’s yearly output each year. During the 1980s, the annual percentage was around 2% or 3%. Overall, American gold production increased during the period from about 2.08 million troy oz. in 1984 to about 10.28 million troy oz. in 1995. In 1984, the Bureau of Mines said 2% of this annual yield was placer gold. That would put it in the ballpark of 200,000 oz. In 1993, when the U.S. produced a record 10.74 million oz., the Bureau estimated domestic placer production at 3,042 kilograms, or about 97,800 troy oz. This was slightly less than 1% of the nation’s reported gold production for the year. It would probably be safe to say American annual placer gold production has generally been in the 100,000-200,000 troy oz. range during most of the past ten years. That’s a lot of nuggets and flakes! Although all of the main 14-producing gold states have streams that yield gold “color” or placer gold, almost all of them rely on lode mining for the vast majority of their gold. The exceptions are Oregon and Alaska — which is the leading placer gold-producing state. The Alaska Department of Natural Resources, Division of Geological & Geophysical Surveys (ADGGS), estimated 141,882 troy oz. were produced in Alaska during 1995. About 95.6% of this was placer gold. The remaining 4.4% (6,230 ounces) was recovered from the newly-opened Nixon Fork hard-rock mine near McGrath. In 1994, before this mine was opened, all of Alaska’s gold came from placer mines – some 182,100 troy ounces. The ADGGS reported there were about 145 mechanized placer mines operating in the State of Alaska in 1995. This was down from 182 mines in 1994 and 196 two years before. The placer industry, which employs many rural Alaskans, was expected to shrink further in 1996, due to flat gold prices and rising environmental concerns. There were an estimated 975 placer miners working in Alaska in 1995. This represented about 29% of all mining jobs in the state. The ADGGS classifies placer mine size as follows: a large placer mine produces more than 2,500 troy oz. of gold a year; a medium-size mine yields from 650-2,500 oz. annually; and a small operation collects less than 650 oz. a year. Using this classification for 1995, the state had just four large-scale placer operations, five medium, and eleven small. These 20 placer mines produced about 50,700 oz. 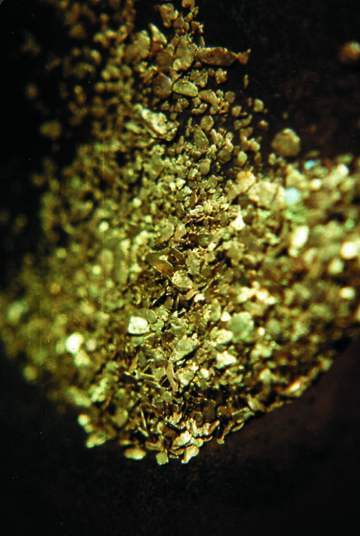 of gold in 1995, about 37% of the state’s total placer production. The large mines processed gold at a unit cost of $341/ounce., the ADGGS said. The medium operations did it at $245/oz. while the smaller mines required $231/oz. While placer miners have to contend with winter weather in the mountainous areas of most states, those in Alaska have to deal with more severe conditions. A late spring or an early winter can shorten the mining season, causing placer mining firms to lose up to 25% or more of their annual gold production. Shorter daylight hours from autumn to spring are also a factor. The bottom line: placer mining, is that it is not always an easy way to make a living. It’s not an easy way to get rich either, even with gold selling in the $380-$390 range. It’s even tougher with gold below $350. While large-scale placer gold miners, most of whom are in Alaska, file production reports, many small-time miners probably never report their gold finds to any government agency. Nor are they usually required to do so, unless they sell their gold. Probably most prospectors never collect or sell more than one ounce of gold a year, so this requirement falls under the $400/year total for filing self-employment taxes with the Internal Revenue Service. Hey, is there any relationship to this $400 IRS requirement and the price of gold? Probably not. Some miners who find larger quantities of gold may use it for bartering–trading their raw gold dust or small nuggets to directly purchase goods and services. This practice is still taking place in more remote areas of America, such as in parts of Alaska. Some miners use their gold in this manner as their “checkbook,” exchanging gold for food, clothing, tools, etc. Besides Alaska, placer miners are also active in the western states; and to a lesser extent, in the southeastern states and in New England. Of these other states, Arizona, California, Colorado, Montana, Nevada, Oregon, Washington and Wyoming realize the greatest take of placer gold. And at least a few thousand troy ounces of gold are collected each year from these states combined. Sometimes, large gold nuggets are found. In 1990, an 8-ounce nugget was found on the slopes of Pennsylvania Mountain, west of Alma in Park County, Colorado. It was named the Turtle Nugget. In 1995, a 27 oz. gold nugget was recovered from Strawberry Creek in the South Pass Mining District of Wyoming. During the past decade, a number of other gold finds have been made with instruments the old 49’ers never had – metal detectors. Hobby and trade publications covering treasure hunting and gold regularly report on many of these new gold finds. Thousands of modern “weekend warriors” and small-scale prospectors use their gold pans, sluices, dredges and metal detectors to look for gold with some success. 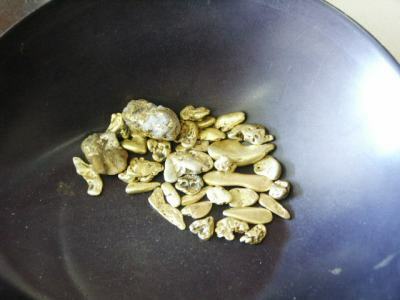 For many gold bugs, getting out and looking for gold is the only way to satisfy their gold fever.